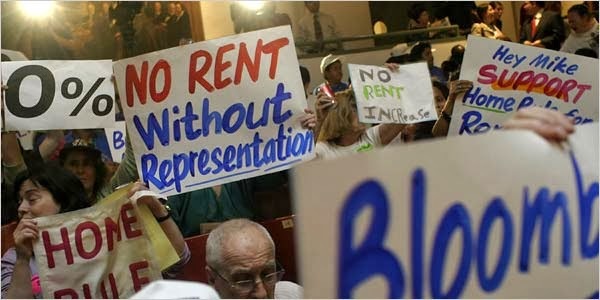 Home Rule over Rents & Evictions: Campaign to get it back! New York City needs home rule over rent and eviction laws in order to address our worsening homeless and affordability crises. Judson Memorial Church, 55 Washington Sq. S. (wheelchair accessible). To pre-register, click HERE., or just show up. 1. The UN Declaration of Human Rights lists self determination as a fundamental Human Right, as is housing. The Brennan Center for Justice has recognized that justice requires home rule over rent and eviction laws. 2. Alexis de Tocqueville observed that the great thing about American democracy great is home rule. NY is generally a "home rule" state, NYS constitution Art. IX, except when it comes to NYC rent and eviction laws. 3. In 1971, Gov. Nelson Aldrich Rockefeller and his housing commissioner Charles Urstadt led the passage of chapter 372 of the laws of 1971, which removed NYC's power to enact rent and eviction laws except to make them weaker. In 2003 the so-called "Urstadt Law" was extended to preclude the city council from enacting any laws having to do with rents, such as selection of public members of the Rent Guidelines Board. 5. Homelessness has risen to levels not seen since the Great Depression and continues to rise. 6. With laws affecting 1,000,000 NYC families - some three million souls - determined in Albany, the real estate industry has "opened up its piggy bank" [Rent Stabilization Association president Joseph Strasburg, 2011] to donate obscene amounts of cash to gerrymandered Albany politicians who are not accountable, skewing the entire state legislature. Getting NYC rent laws out of Albany will solve 50% of Albany's campaign finance problems overnight. 7. Why “Urstadt”? Charles Urstadt was on Reagan's 1980 transition team, which made the proposal, later adopted, to raise the rent contribution of Section 8 tenants from 25% to 30% of income, and to cut the HUD budget by 90%, from about $30b to about $3b. Urstadt later chaired the Battery Park City Authority when it reneged on its obligation to devote a substantial portion of its income to the creation of affordable housing. Urstadt went on to become one of the leading developers of suburban malls in the US. But the law denying us home rule is really a Rockefeller law. Putting important matters before the state legislature is a trick Nelson Rockefeller learned from his grandfather, John D. Rockefeller Sr., founder of Standard Oil, now Exxon. "Standard Oil did everything to the Pennsylvania legislature except refine it" [Robert Caro, LBJ vol. ii]. 8. Housing activists have always known that the lack of home rule is a gross injustice preventing any effective response to our worsening affordability and homeless crisis – namely, stronger rent and eviction protections. What has changed is that now everybody knows it. Restoring home rule was on the Working Families and City Council Progressive Caucus [and Tenants PAC's] candidate questionnaires in 2013 and every successful candidate responded favorably. The connection between real estate money and the effort to enact public financing of elections was not missed by the Moreland Commission, which focused on the 421-a quid pro quo. 10. With a new mayor committed to leading the right to restore home rule starting on Jan. 1 and a new progressive majority emerging in the city council, with the need to address our outrageous housing crisis clearer than ever and the Governor and entire state legislature up for election next November, and with the current laws due to expire in June 2015, now is the time to demand New York home rule over rent and eviction protections, starting from the communities and through them their elected representatives!